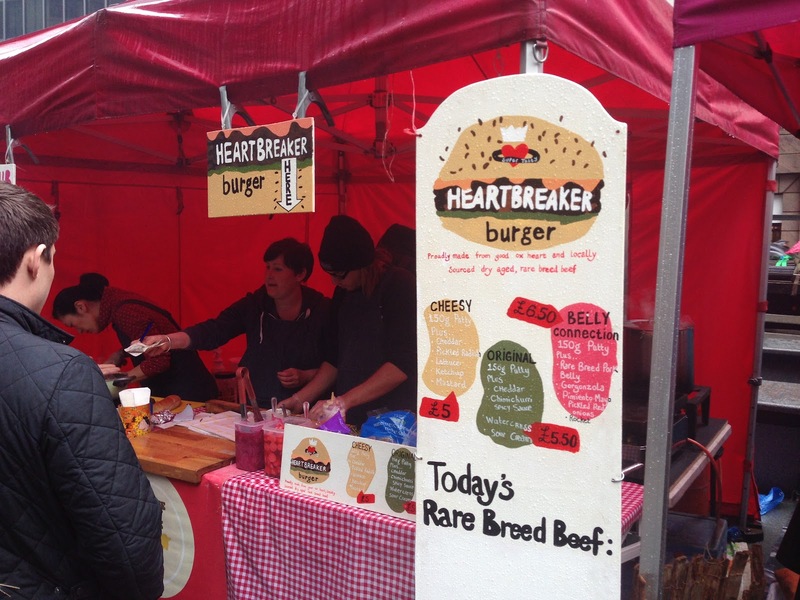 The Heartbreaker burger patty is made up from 50% beef and 50% ox heart, yes heart. No doubt a few people have lost interest in the rest of this post due to the ox heart but would you rather play supermarket frozen food roulette that we've seen recently than to eat the a delicious, natural part of an animal that you know is being served. 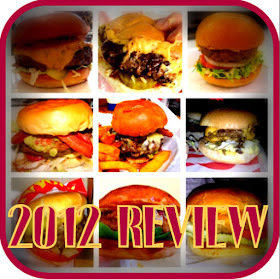 Myself, I am keen to try almost anything and take it from me, this burger is terrific. 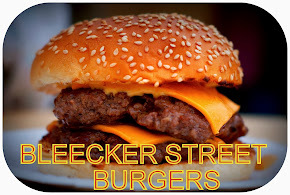 I had tried to get my hands on this burger a couple of times before at Kerb, but arriving quite late both times they had sold out. Maybe people are not as put off by ox heart as I'd thought. I've now managed to eat their burgers twice in the last 6 days. Despite their being 3 burgers on the menu both times I went for the belly collection which is topped with pork belly, gorgonzola, pickled onion, pimiento mayo and rocket. It's pretty damn good and the patty's right on the money, a beef eaters joy. The 60 day ageing process has given the patty a really deep beef flavour similar to Elliot's burger and whilst the ox heart doesn't have a distinct flavour there is a slight iron taste that comes through towards the end of a bite. The seasoning and frying has been spot on both times - The patty is as good as I've tasted. The bun's bottom becomes very moist when eating but the denseness and quality of the bun makes sure this is no problem and you're left with one of the best juice catchers I've put my hands on. The gorgonzola in the heartbreaker isn't melted on the patty as I had expected but is on top of the pork belly. The pork belly isn't always in your bite due to the smaller size in comparison to the main elements but when you do get it, the traditional fatty salty notes ride along with the beefiness perfectly. As you know I love pickled onions on a burger and here and the sharp tang is as good as I've come to expect from it and with the spicy creamy mayo flows throughout. I don't really see rocket working in a burger and thankfully you don't really pick up on this much due to the patty and bun dominating your taste buds. Street food is full of real characters: The Rib Man & Burger Bear to name just a couple. They are vocal, intriguing and make the slightly longer wait you can have at a peak time almost fun. Even just watching them serving could be an enjoyable past time. My experience ordering and waiting at Tongue 'n Cheek in this short time however are polar opposites. My first visit was at Kerb City Point and was the one of the most depressing 20 minutes wait I've ever had. The stall is split into 2 headed queues; 1 for burgers and 1 for the porky sub, neither lines were obvious and when the team were asked about these queues it seemed as if they had no clue what they were talking about. There was no communication with the people waiting and it seemed as if they had all just woken up after a boozy night where they had all had a row - I've not seen a more miserable bunch on a food stall. At the gherkin however I only saw 1 face from Friday and thankfully now there were some smiles. The enjoyable faces and chat so often seen with street food was there again, despite the miserable weather. I had the Belly Connection on Saturday for the first time. You're not wrong - it's excellent! Just to add; they've changed the greenery from rocket to gem lettuce since the above review was written.